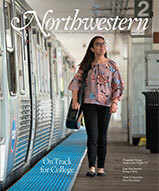 Read about House by Northwestern's Aug. 23 ribbon-cutting ceremony. 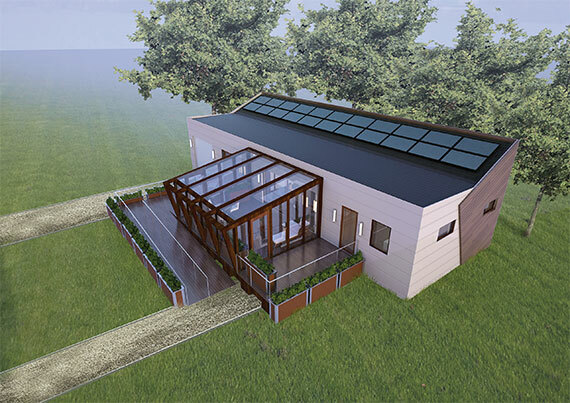 Student team builds sustainable, solar-powered showcase home. Designed with roof-integrated solar panels, ultra-efficient heating and cooling systems and photocatalytic surfaces that break down harmful pollutants in the air and keep surfaces clean when exposed to sunlight, the student-designed solar home "Enable" is the University’s first-ever entry into the U.S. Department of Energy’s Solar Decathlon. The collegiate competition, which includes 12 teams from around the world, challenges students to design and build full-size, solar-powered homes. The 51-member House by Northwestern team started construction in May. The 994-square-foot house — a two-bedroom, two-bath single-story unit designed for soon-to-retire baby boomers living in Chicago’s northern suburbs — was to be completed in August. The home is expected to be 90 percent more energy efficient than the average North Shore home. In the fall the house will be disassembled into three modules and shipped 1,000 miles by FedEx on flatbed trailers to Denver, where it will be reconstructed and compete against a dozen other entries in contests such as architecture, energy production, innovation and market potential. After the Solar Decathlon, the team will bring the house back to Evanston, where it will remain open for public tours.